This document contains guidance on how to avoid errors frequently seen in public procurement for projects co-financed by the European Structural and Investment Funds. It is intended to facilitate the implementation of operational programmes and to encourage good practice. It is not legally binding but aims to provide general recommendations and to reflect best practice. Following on the great success of the first edition with more than 70,000 downloads, we are particularly happy to present you with the new and updated version of the Public Procurement - Guidance for practitioners on the avoidance of the most common errors in projects funded by the European Structural and Investment Funds. 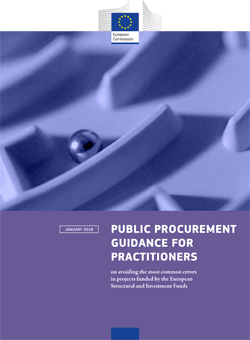 This improved document takes into account the new and simplified EU rules on public procurement and the first direct experience from their implementation on the ground. Managing authorities of European Structural and Investment (ESI) Funds programmes and other EU-funded programme authorities may also find the guidance useful when acting as public buyers or when conducting checks on public procurements carried out by beneficiaries of EU grants.